A New Earth – Awakening to Your Life’s Purpose (reading from Thursday night). 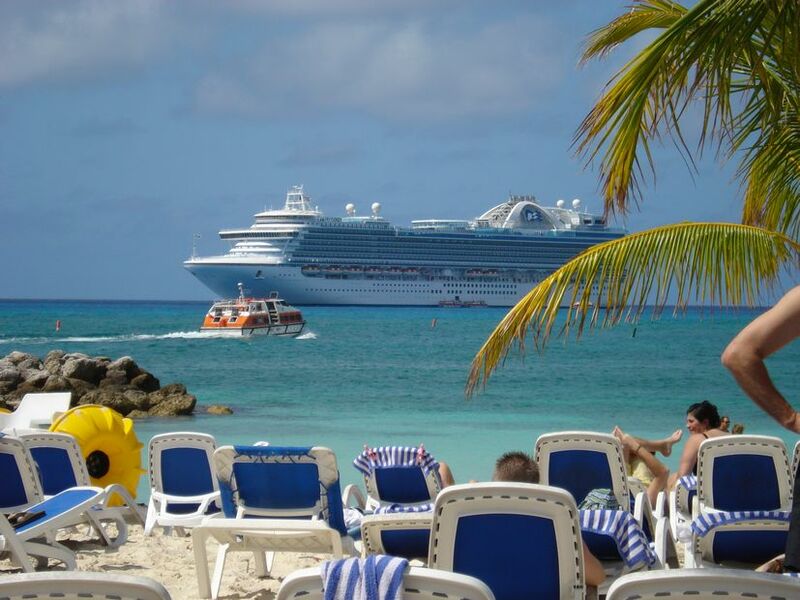 It is getting exciting we booked our Eastern Caribbean cruise a year ago and now the vacation starts this weekend. Our cruise in on the Princess line and is for 10 days and we’ll be in Florida a couple of days both ways. We are going with 4 other couples consisting of 3 brothers and their wives and 2 brothers and theirs (although I’m not a wife!). Our mini suites are side-by-side and we can adjoin our balconies which is the reason we booked so far in advance. We visit St. Thomas, St. Lucia, St. Kitts, Antigua, Barbados and Princess Cayes. I’ve never been to any of these places before and for 2 of us couples this is our first cruise. 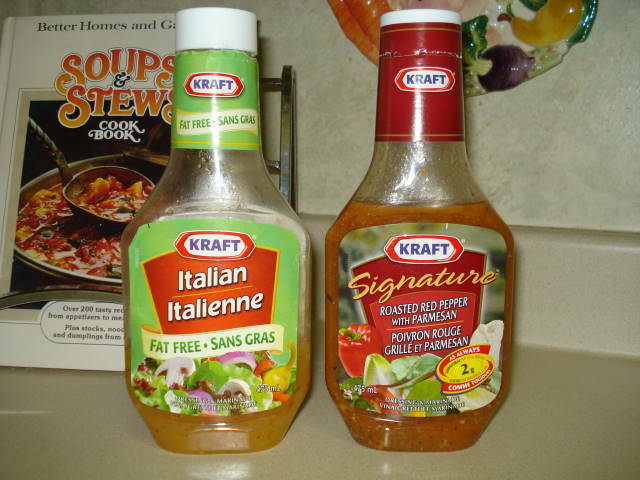 A couple of staples I always have on hand are These dressings are low fat and I used them moderately in my salads. But they come in handy for delicious and quick dinners as well. I mostly bake chicken with them. Tonight I was experimenting with 2 chicken breasts and . 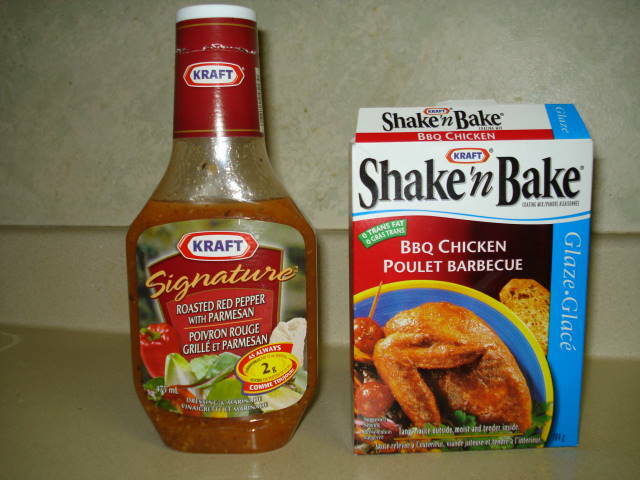 I coated my 2 chicken breasts with the BBQ flavour Shake’nBake and baked for 50 minutes at 350F. Meanwhile I sauteed 2 thinly sliced celery stalks and 1/2 cup finely chopped onion in a little bit of olive oil. In a pot I boiled approximately 3 cups of Smart rotini pasta that has the benefits of fibre. In another pot I boiled baby carrots. Once the veggies were nicely softened I poured in KRAFT Signature Roasted Red Pepper with Parmesan dressing. I am guestimating about 1/2 cup. The bottle in the picture was full before I started the recipe. I added a heaping tablespoon of tomato paste and with the pan on low heat mixed these together, then the drained pasta was added. 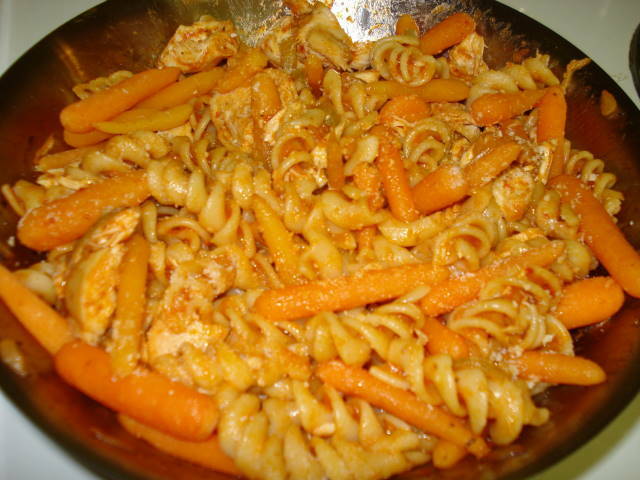 When the chicken was ready I sliced it into bitesize pieces and added it to the mixture, added the cooked baby carrots and finished off with some parmesan cheese. Stir and done! It was very yummy and a complete and easy meal. I think some lightly sauteed mushrooms would taste yum in this dish . Add a fresh salad and bon appetite! Sunday….I Should Have Just Stayed in Bed! You know, it is so bad when you wake up at 7:00 a.m. on Sunday, and you feel good, and the sun is shining and you plan a productive day. Then 4 hours later you come back home and wish you’d never gotten up. THAT was my Sunday. After quietly enjoying my coffee, a special time for me in the morning, I got myself ready to take an hour drive north to my mother’s place to water her plants and collect her mail. She has been in Florida since the end of January. I dressed partially in my gym wear anticipating a stop on the way home at the gym for a Body Pump weight class. I loaded a few boxes of Christmas decorations into the car to store at her place. It was a busy day today. A good day. It included my facilitating a Personality Dimension’s workshop for first year nursing students. This is a fun interactive workshop and a very enlightening tool that I facilitate to different program, first semester students at my college. The students see it as a real eyeopener and its usually their first introduction to a workshop such as this. It is helpful for the students to understand themselves and other people, a tool they can use when they are working in groups on assignments, meetings, work and in their every day life with family and friends. 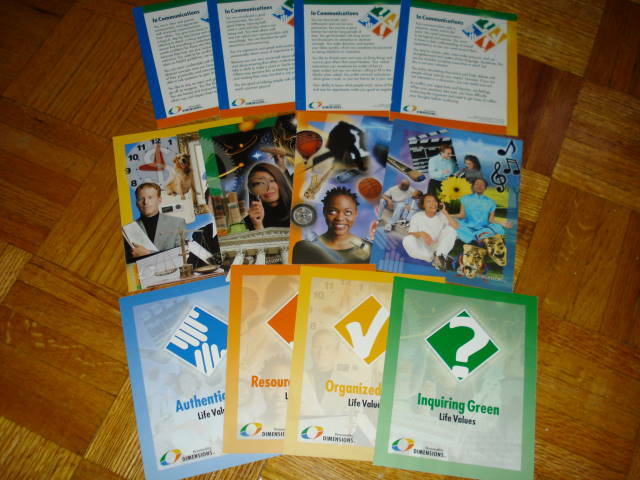 You might be familiar or attended a True Color’s workshop, this is the Canadian version. The concept of Personality Dimensions goes all the way to Hypocrates from which time on researchers have studied human behaviour. Researchers have all come up with one commonality being there are 4 different temperament styles. Each of us has these 4 temperament styles which Personality Dimensions differentiates by calling Inquiring Green, Organized Gold, Authentic Blue and Resourceful Orange. We have one temperament style that we feel most comfortable with, our strongest colour and comes most naturally to us (some people feel equally comfortable in more than one). However, when we need to we are able to use the other temperament styles though they may not feel as comfortable to us.